"Sixers" is the name of Ryan's & my new Guitar Hero band in honor of our 6th anniversary. If you read my previous post, you know that Ryan had to leave at 4a.m. Thursday morning for the Gulf, so he's missing our anniversary today. Well, he found out that he was leaving at work on Wednesday, and when I got home after church Wednesday night I found the new Aerosmith version of Guitar Hero on the kitchen island with a "Happy Anniversary Mom & Dad" note from Jack & Harley. I thought it was very sweet of the dogs to go buy us an anniversary present, and seeing as how we completely ignore them while we play Guitar Hero, I was shocked that they chose to get that for us. They're so thoughtful! Anyway, we usually try to somewhat follow the traditional anniversary gift lists for anniversaries, and 6 years is supposed to be candy or iron. We decided that playing "heavy metal" on Guitar Hero counts as "iron", so that's our justification. Ryan truly knows the way to my heart! We spent last weekend enjoying Fort Worth, which is something we should really do more often since we live here! We went to the Kimbell Art Museum to see the Impressionists exhibit, and I was blown away. I love art museums, but they're not necessarily Ryan's thing. He was totally into it though, and enjoyed it just as much as I did. 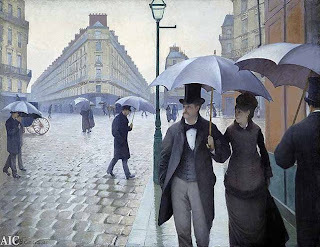 I'm a huge fan of a lot of the artists whose work was on display--Cezanne, Monet, VanGogh, Pisarro...but I was THRILLED when I saw that the hugest painting on display was Gustave Caillebotte's "Paris Street, Rainy Day"...one of my very favorites! I think I like it because the couple looking across the street not paying attention is probably about to get whacked by that guy's umbrella coming toward them...it just makes me laugh. You can see the bee's wings!! The best part of the weekend was getting to spend it with this guy. Ryan is definitely my perfect match. As much time as we spend apart, it is great that we enjoy each other so much when we are together. Here's to another 6 years!! Happy Anniversary! I hope he returns to you very soon. We spent our last anniversary in Fort Worth - great place! Happy Anniversary. I actually thought about you guys this morning and that it was your anniversary. I have a weird memory and remember random dates and your anniversary happens to be one I remember! 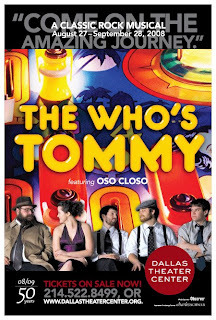 "Tommy" the pinball wizard...I watched that movie one time and felt like I was tripping out on drugs the whole time. I can't imagine how freaked out I would have been had I really been on drugs. thank you! you and ryan are an attractive match. That sounds like a great way to celebrate an anniversary:) I'm glad you had so much fun! We miss you guys so much! I am happy you were able to celebrate, even though it wasnt on the actual day!!! you all look great ! and I love your pictures~! Happy Anniversay, Sarah! I've been "stalking" you for a little while. Glad to know you are doing well. Check out our family blog if you get a chance!